Nepenthe means "isle of no care." While Big Sur isn't an island, Nepenthe Restaurant may make you forget your cares - at least for a while. It sits on the coast, just above the Pacific Ocean. The rustic-style building seems to grow out of the hillside, and the views are enough to make you swoon. Don't let any of your food snob friends discourage you from eating at Nepenthe. The menu is more than adequate if not up to the standards of a gourmet restaurant. More importantly, Nepenthe is not just about the food, it's about the whole experience. Reviewers on Yelp mostly love Nepenthe, saying "This is a place you have to go to at least once, for the view alone!" That being said, the most famous (and tastiest) menu items at Nepenthe are the Ambrosia burger, French fries and berry pie with ice cream. A single order of fries is enough for several people, and they're especially tasty if you ask for Ambrosia sauce to dip them in. They also have a wine list featuring some of California's top wineries. 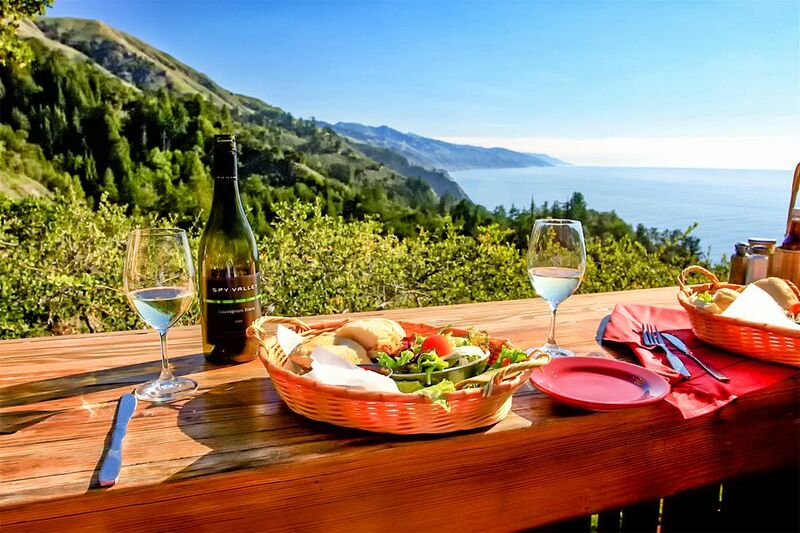 Nepenthe is a good place to stop for a meal if you're traveling on Highway One between Hearst Castle and Big Sur. Use this guide to the Big Sur drive for more tips and ideas. No visit to Nepenthe is complete without a stop at the Phoenix Shop next door. They have an especially nice collection of artisan jewelry, handmade scented soaps, paintings, pottery, and books, from local artisans and around the world. Seats on the back patio have the best views. Expect to wait to get one. Order a beverage the bar and find a spot outside to take in the view while you wait. If you're in a hurry, look left as you enter the Nepenthe patio. Seats at the railing are available on a first come, first served basis. Just hang out nearby and wait for someone to leave. Servers working in that area can sometimes help you to know who's leaving next. Nepenthe is best when skies are clear, and it's warm enough to sit outside and enjoy the view. Views are an important part of the Nepenthe experience. If you don't manage to get there before sunset, the indoor, wood-burning fireplace is nice after dark. Even if you're not a birdwatcher, you'll enjoy the ongoing avian drama at Nepenthe. For years, the local Steller's Jays have been at war with the serving staff. They're the blue birds that look like punk rockers having a bad hair day. Despite the staff's efforts to stop them, they still sometimes manage to take off with a package of crackers or their latest favorite, a beak-full of French fries. From time to time, winter rains precipitate mudslides that can close California Hwy 1. That could block access to Nepenthe. Use this guide to find out how to check conditions and find detours. Check the hours on Nepenthe Restaurant Website. They do not take reservations unless it is for a large group. Nepenthe is located on California Highway One, about 30 miles south of Carmel, near the Ventana Inn and Post Ranch Inn. Look for the Nepenthe sign on the west (ocean) side of the highway. What Should You Stop to See on Carmel's 17-Mile Drive?